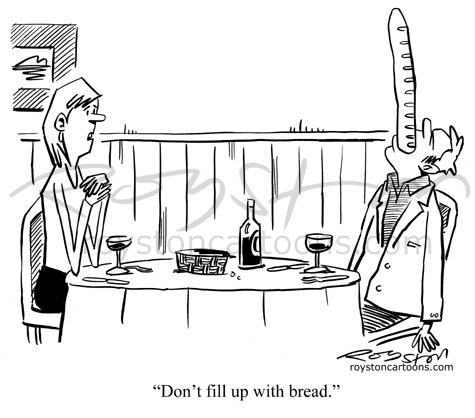 "Don't fill up with bread." I'm always reluctant to use hip, techie words -- largely because you never know if they're still going to be around next week -- but this cartoon, which is in the current Private Eye, was the result of an experiment in "crowdsourcing". OK, crowd is probably putting it a bit strongly, but a handful of people responded when I put the following message on Twitter a couple of weeks ago. "Gag cartoon writing session: throw some random themes/ideas at me!" I've done this before, and sometimes people don't quite get it, and give me over-specific scenarios (with hindsight, I should have stuck with just themes, not ideas) and sometimes they do. The US cartoonist Mark Anderson did and simply said "French bread", so off I went to brainstorm on that. I came up with this fairly quickly. And it sold to the first mag. So thanks, Twitter, and thanks, Mark! Thinking up themes for cartoons can be difficult. I've tried picking out words in dictionaries, using online "random idea generators" etc, but there's no substitute for getting topics from other people because then you have someone to show the result. I often ask those around me, mostly my long-suffering wife.